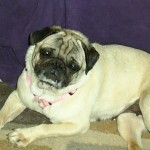 Amy seems to be a very happy pug and ready to live the good life now. She did well on a harness but did not know stairs. She’s ready to give and receive much love. She is receiving vet care and as soon as he is in foster care we should receive an update! Amy’s happily ever after story. I changed Amy’s name to “Sweet Annie” – sweet is obvious and Annie for a little dog I used to know. Annie is doing so well. I am amazed at how easy this has been. She is growing younger too and has dug out(from a bowl in the corner) my puppy’s old chew toys to play with. Annie may only have a few teeth but she really likes his old stuffed toys(with no stuffing left inside) and his big chew ropes. She even likes gnawing, or gumming, his hard nylon bones. This weekend she has started chasing him a little and being more active in their play. She is running some and pretty much does the stairs without thinking – Yay! I’m trying to work a little each day on her left hind leg to build muscle. It doesn’t really bother her, but is noticeably weaker. Her legs are not too weak – she learned to stand up and put her paws in my lap when she wants to come up and be held – I can’t resist the look.